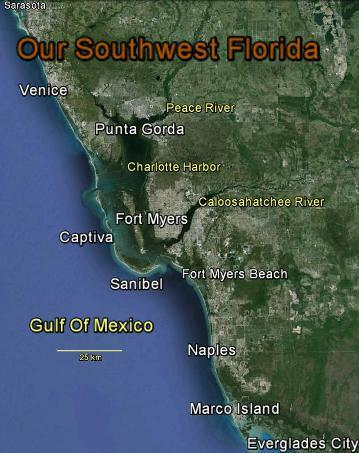 Southwest Florida extends along the western coast of Florida from Sarasota/Venice south to the Everglades. Although well over a million people populate the area, many sandy beaches remain free from development. Wildlife abound in refuges and parks open to the public. Charlotte Harbor is recognized as one of the premium sailing and fishing areas in the United States. Summer can be hot and humid but winter days are typically warm and sunny. Thomas Edison (the inventor) and Henry Ford (the car guy) built their winter homes here along the banks of the Caloosahatchee River. These days many of our residents are seasonal too, fleeing winter's ice and snow of Canada, the northern United States and other countries as well. Visit between November and April for the best weather! Most visitors from abroad will fly into Southwest Florida International Airport (RSW) in Fort Myers or arrive by bus from other parts of Florida. Visitors from some parts of the United States may find less expensive flights to Punta Gorda (PDG). Although Friendship Force ambassadors may be home hosted from Punta Gorda/Port Charlotte to Naples, we all get together for group activities. To find out about some of the attractions available, click one the buttons below for more information.